Starting December 2 and going all the way to December 14th in the Tokyo Anime Center in the otaku district of Akihabara, doll creator Paper Moon will be hosting an anime figure party. 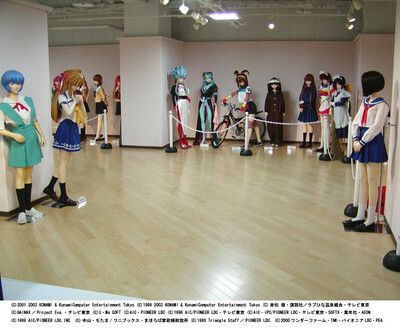 They will have on display 30 1/1 figures ranging from characters like Rei and Asuka from Evangelion, Saber from Fate/stay night, Sakura from Sakura Wars , and Al from Demonbane. They will even have some for sale at 200,000 to 480,000 (about $1,800 to $4,500). More reasons why I want a house in Japan.